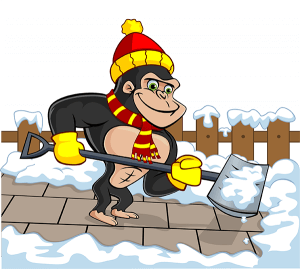 Our fully trained and licensed Gorillas arrive professionally uniformed and ready to carry out all aspects of our Maple Ridge Snow Removal and Salting Services according to WCB regulations, and Gorilla Property Services high standards. In addition, our work is insured with CGL insurance of $5 million and WorkSafeBC of $5 million inclusive. Each service is tailored to your specific property needs. As part of our snow removal and salting service, we offer maintenance of all exposed common areas. This is carried out the night prior to a projected frost or snowfall. Gorillas use mechanical blowers or elbow grease with shovels to perform snow removal. Our technicians use special service vehicles that we refer to as our “Gorilla Mobiles”. These specially stocked vehicles allow our Gorillas to salt large areas such as parking lots.